This is by FAR Steve’s favorite breakfast. 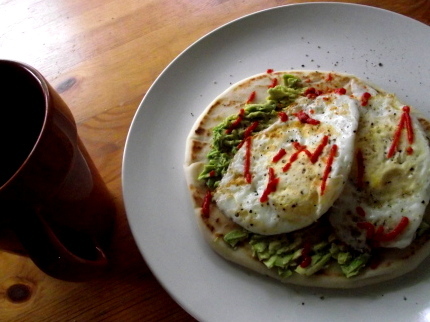 I do about 99% of our cooking but when I’m lazy on a Saturday morning I’ll send him into the kitchen and tell him to make the “Naan thing.” It’s the perfect blend of flavors (fried egg, avacado, sriracha and naan) and makes a wicked start to the day. In a second- and hot- skillet warm the Naan bread one piece at a time. Alternately, if you are making this for several people you can warm the bread under the broiler but watch it closely as it blackens quickly. Mash and spread a half avocado over each piece of Naan, top with the fried eggs and drizzle with Sriracha sauce and salt & pepper to taste. Fold Naan in your hand to eat like a sandwich. That’s it…. nothing more than that and you have a great and easy breakfast that is perfect after those nights when friends have a few too many drinks and then have to crash at your house. Steve tells me that this heaping plate of goodness comes from his old rock climbing buddy Eddie. Thanks Eddie. I owe you one.